“Webster defines “snug” as warm secure shelter marked by cordiality and an opportunity for ease and contentment. At Snug Cottage we’ve created an environment that would prove Mr. Webster true. Located at the second highest point in Provincetown (Miller Hill), our Massachusetts bed and breakfast offers amazing views of the Provincetown Harbor from 4 of our 8 guest rooms and our expansive front patio. An easement with our property guarantees an unobstructed view during all seasons. Individual artists and painting classes can be seen across our street capturing the famous ‘Provincetown Light’ and views. Pull up an Andirondack chair, morning breakfast or an evening glass of wine and enjoy the same view. In addition, at all times during the day, you’ll have the lowest cost activity in Provincetown — people watching from our front patio. 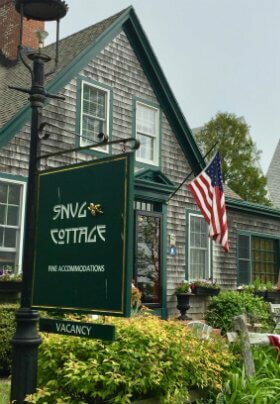 Snug Cottage is on Provincetown’s world renowned ‘guesthouse row’ in the East End of town. We’re a quick 1 1/2 blocks to the vibrance of Commercial and an easy walk back when you’re ready for some serenity. We understand it’s your vacation and our responsibility to help make it memorable. One fine day we hope you will visit Snug Cottage and give us a chance to serve you. Please click here to view a virtual tour of our property. Summer season in Provincetown: On the busiest weeks nearly 80,000 people come to enjoy the fishing village of 3,000 year round residents at Land’s End of Cape Cod. Escape your local summer hight temperatures and humidity to enjoy the cool breezes of the Provincetown Harbor, Cape Cod Bay, and The Atlantic Ocean.